Real Life Go Kart in Tokyo (東京公道ゴーカート) is one of the most exciting fun activities you can try in Tokyo. It is a life time event that happens to you. It is a Go-Kart driving the public street of Downtown Tokyo, going through from Shinagawa, Tokyo Tower, Roppongi and the world famous Shibuya Hachiko Crossing. It will take about 2 hours. You can rent Costumes. You will make a reservation for time and date. You can ride the karts from 2 people. Admission: 7000 JPY (including tax), 5000 JPY for facebook review price. You need Japanese Diver license, an international driving license or permission to driving car in Japan. 1. use Keikyu Line to Kitashinagawa. It is the Go-Karts service on the public street of downtown Tokyo. You can enjoy the Go-Kart privately or with a group and enjoy costume while you are driving. There are several course prepared at Maricar. This video is for 2 hours course. There is a 3 hours course that also visit Rainbow Bridge. You can try Go-Kart for daytime and night time. "Do you love the video game Mario Kart? 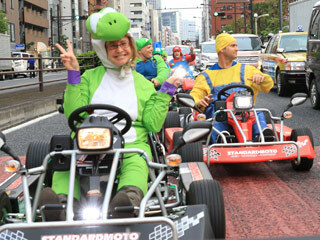 Well now you can really do it, drive Go-Karts all around Tokyo. It is a crazy, one of a kind experience that you can only get in Japan. I believe there are two companies offering this right now, we went with Maricar. It was very easy to set everything up, I just private messaged them through facebook. There are a couple different coarse's to pick from. We went with the 2hrs driving around Shibuya, Shinagawa & Roppongi. We crossed through Shibuya crossing 3 times. Everyone on the streets watching us was taking pictures and waving. I felt like a superstar ? At Maricar shop you can pick out a costume or bring your own. They have many costumes to pick from. Not only Mario Kart stuff, they also have some Disney costumes. We had a group of 10 people. You can have a larger group but you will be broken down into sets up 10. Each group will have a lead driver from the Maricar shop and someone in the back. You can also just have a group of 2 people. They are very flexible and easy to deal with. You must have a SOFA lic. or an International drivers lic. to be able to drive. You are on the street with all the other cars and need to know the rules of the road for safety. I have to admit there were sometimes I felt a little nervous….mostly around the taxi drivers…..I don’t think they liked us. All in all I think this was one of the most memorable things I have done in Japan. We all couldn’t stop smiling the whole time!! We were also lucky to have Toshi?from MustloveJapan videotaping us."